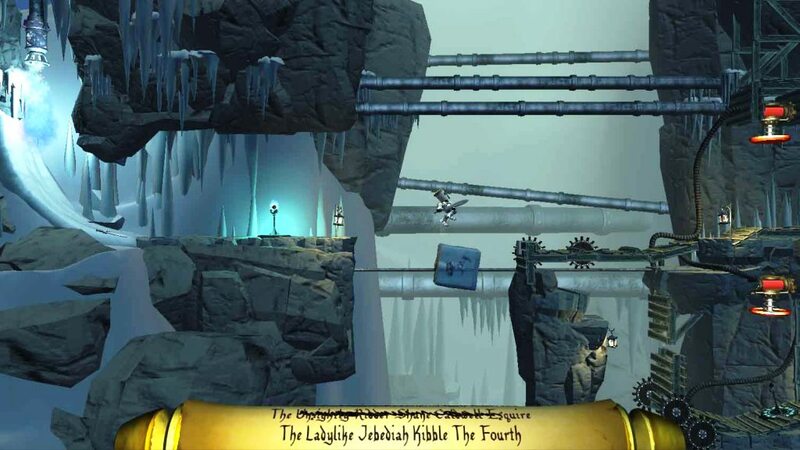 One of my favourite types of games to play is a puzzle platformer. It’s awesome to be able to play a game at your own pace and challenge your brain a bit with some problem solving every once in a while. Lately I have found a lot of these games are just ripping off Limbo’s dark atmosphere and short gameplay. That’s not to say these games are bad, but much like zombies, rhythm gaming and Kanye West, too much of the same thing becomes stale and annoying. Life Goes On heavily strays from the Limbo’s of the world and stays true to the classic puzzle platformer while adding humorous and morbid twists. Under order from the King, you play as a heroic dimwit knights who are attempting to get across the mazes and traps ahead in order to collect the ever so shiny chalices across the way, also known as the Cup of Life. Unfortunately for these individually named knights, not all of them will succeed in obtaining the chalice and they know it. The only way to make sure the next knight has a chance to obtain the ironically named chalice is to sacrifice their bodies in various and painful ways. Whether you need to impale yourself in a pit of spikes to become a platform, incinerate your body to reach a button, or launch yourself from a cannon to move a platform with your face, you will inexplicably and without hesitation do this for your King! This is the twist that separates LGO from the rest of the pack. It is incredibly fun and morbidly satisfying playing a game where dying is a requirement. The objective to progress to the next level is to simply reach the Cup of Life with your fortunate knight. 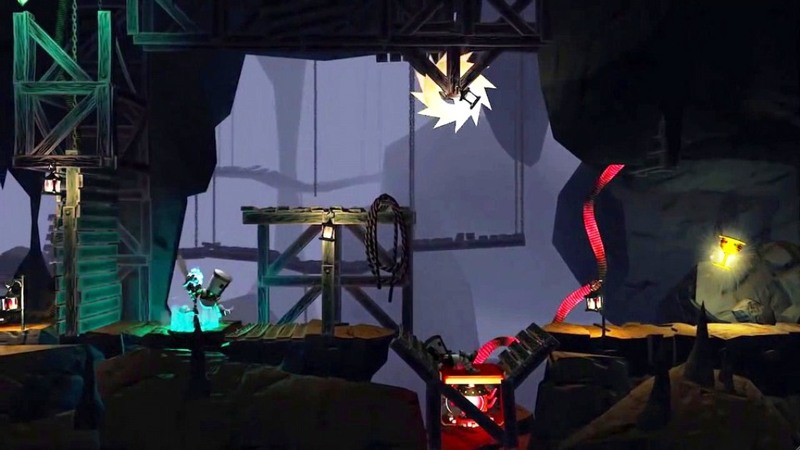 Each of the 54 levels has three additional challenges that you can choose to complete; a timed trial, completion of the level under the recommended body count, or to sacrifice yourself to the lurker on each level who is ridiculously named Jeff. To complete all three in one shot is nearly impossible after the first chapter so you’ll have some replay-ability if you are looking for full completion. 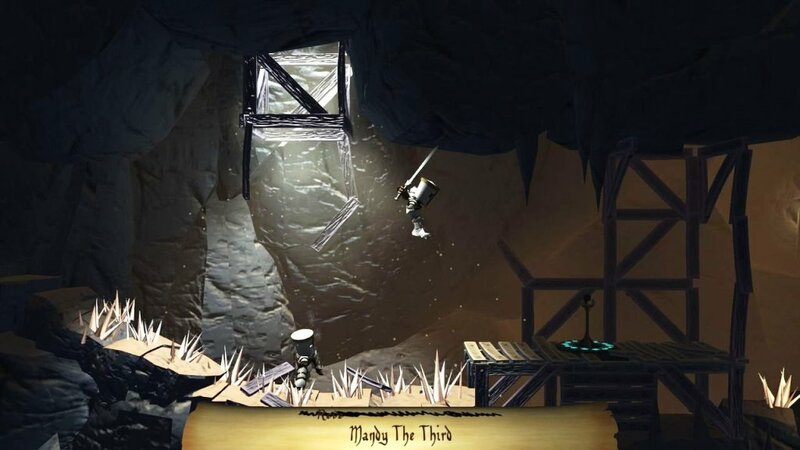 The controls are basic in that you really only have to run, jump or shoot yourself from a cannon to advance through the puzzles, fortunately everything is very responsive to you aside from some frame rate issues if you choose to sacrifice many knights for comedic purposes. The levels usually do not exceed the two and half minute mark, so you will feel like you are succeeding at an incredible pace. In truth, you will be succeeding at an incredible pace because where this game strives in comedic morbidity and the “fun factor”, it lacks in difficulty and depth. There will be moments where you have to stop and think to complete a puzzle, don’t get me wrong. It just never gets to the point where you start to sweat and question your intelligence or ability. Because you have unlimited lives without having to restart a level, coupled with the maps being very short in most cases, you are not overly challenged to retain patterns or memorize map designs. This is beneficial for the perfectionist to be sure but when I turn on a game like this, I’m always hoping for more of a challenge. But maybe that’s just me and a small collection of people. I like to think that I write honest reviews and hope that you will take my advice or opinions with you to the bank, so I’ll probably never write these words again: Don’t let MY negative be a deterrent for you to try this game. I feel that anybody who enjoys this genre will be incredibly infatuated with Life Goes On. While the challenge only reached the plateau of normal difficulty for me, that was heavily outweighed by the comedic charm I got throughout my time with this game. Death normally doesn’t call for celebration so it’s gratifying to have a game that morbidly shines bright and is incredibly memorable. With an upcoming free of charge DLC on its way, now may be a good time to grab this gem.